Dr. Martinez is very professional in every sense of the word. I am happy I was able to find a gooddermatologist. I felt comfortable with the examination and I did not have to wait, rather they were waiting for me to be ready. Dr. Martinez is very professional in every sense of the word. I am happy I was able to find a good dermatologist. I felt comfortable with the examination and I didnot have to wait, rather they were waiting for me to be ready. The whole staff was friendly. I really had no wait time. Was seen right as I came in during my appointment. *Please note we have a 48-hr cancellation policy with a $150 fee. Kindly notify us by calling and speaking with a staff 48 hours in advance if you need to cancel or reschedule your appointment* *We only confirm appointments once insurance verification is obtained in our office. For this, we need your insurance information uploaded onto Zocdoc, or emailed to us* *For self pay patients, please call the office for rate* Gabriel J. Martinez-Diaz, M.D., FAAD is a Stanford University trained and board-certified dermatologist practicing aesthetic, medical, and surgical dermatology since 2014. Initially practice in Atlanta, GA for one short year before realizing that he missed the midwest charm. He relocated to Chicago in 2015, and has been associated with Northwestern Medicine, as an independent physician since then. 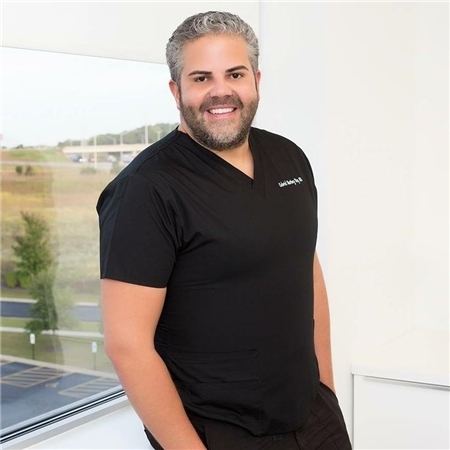 In 2017, he founded M D Aesthetics and Dermatology to provide comprehensive and cutting edge aesthetics and dermatology care for the city of Chicago and its residents. He is ecstatic to have found a new home for his practice in his favorite and one of Chicago’s most thriving neighborhood – the West Loop. Dr. Martinez-Diaz is originally from Mayaguez, Puerto Rico and is fluent in Spanish. He moved to Madison, Wisconsin to obtain his degree with honors in Biomedical Engineering at the University of Wisconsin-Madison. Dr. Martinez-Diaz attended Stanford University where he received his medical degree and gained distinction as a Doris Duke Research Fellow. He completed his Research Fellowship at the University of California-San Francisco. Upon graduation from medical school, he completed his medical internship at Hennepin County Medical Center, in Minneapolis, MN. He completed his dermatology residency at the University of Pittsburgh Medical Center in Pittsburgh, PA.
Solitary, enlarging painful violaceous tumor on the cheek of a 9-year old (Skin involvement of Pre-B-Cell Acute Lymphoblastic Leukemia/Lymphoma), JAMA Dermatol. 2013; 149(5):609-614. doi: 10.1001/jamadermatol.2013.3053a. Durkin J, Martinez-Diaz GJ, Gehris RP. A 7-week old Nepali Girl with a Perianal ulcer: brief report. Pediatr Dermatol. 2014 Jan 3. doi: 10.1111/pde.12277. Martinez-Diaz, G.J. ; Berk, D.; Brucknner, A.; and Kim, J. Annular and keratotic papules and plaques in a teenager Arch Dermatol. 2009;145(8):931-936. Doctor went fast, barely looked at the problem area and did not communicate instructions well for medication he prescribed. He was not professional and did not read the forms filled out to understand patient problems beforehand. He’s my favorite! I really enjoy going to see him because you can tell he cares about his clients. Dr.Gabriel was great! Very upfront and knowledgeable. Front desk staff not so friendly but Dr Gabriel was helpful in diagnosing and prescribing meds for my ezcema. Great bedside manner and very personable. My only qualm was that Dr Gabriel sent 4 prescriptions to my pharmacy but didn’t personallygive me details on the medicine I needed to take ... that, combined with my pharmacy (CVS) filling the wrong prescription led me to take medicine that was incorrect and not related to ezcema at all. Not only did I see the doctor for just a few seconds, but when I had asked a specific question regarding the side-effects of Accutane, I was told to read a pamphlet. I suffer from both anxiety and depression and takemedication for both, so it seemed rather irresponsible to be recommended Accutane without having been asked about my psychological state. Additionally, my acne had actually gotten considerably better since my previous appointment where I was prescribed some topical medication that I proceeded not to take. As I was explaining that I had instead opted to cut sugar from my diet, Dr. Martinez-Diaz seemed almost annoyed at this admission. I found the appointment to not only be a massive waste of money and time, but also deeply soured my opinion of dermatologists. If you find yourself struggling with acne-related issues, try natural alternatives such as reducing your intake of sugar, adding green tea to your diet, staying hydrated, or change up your skin care routine. For me, washing my face exclusively with micellar water completely cleared my skin! Super efficient. No long wait time. Had a solution to my adult acne and so far? So good! It was great. No inconvenience. Everything was fine. I went in for an annual skin screening. The whole experience was a breeze! I was in and out very quick, there was little to no wait time. The exam was thorough but quick. The entire staff made you feel extremely comfortable. I would definitely recommend them! Very professional, extremely helpful and staff is amazing! Dr. M-D is the best! Always so pleasant, personable and super informative. Most of the appointment was with an assistant. Saw doctor for less than 5 minutes. Not thorough at all. Strangest experience I had with this doctor. If you want someone who you feel is invested in your health, please go somewhere else. The office staff and his assistant are incredible and the main reason I am returning to this location. I also do not have many other local options with my current insurance. Dr. Gabriel seems to really be a brand pusher. I’dassume he is receiving compensation for the scripts he writes. He gave me little to no information about what he was prescribing me and seemed annoyed by questions. I had to do all the research myself, which I do not mind, but I find it unprofessional to not give your patients all the information they need. He spent less than 10 minutes talking with me. He did not ask about current products I use or have tried. Before prescribing a high retinol serum he did not tell me to make sure nothing else in my routine included retinol or give me any other warnings that I had to find for myself. I also found it odd that there was no follow up appointment requested to see if the products he prescribed me are working. Dr. Gabriel, please do better on catering to your patients rather than making us feel like a commission check. Your job is to be informative and help those suffering with acne not to blindly prescribe medications. Everyone was kind and professional. Dr was great! Excellent, great feedback and recommendations. Very organized and orderly practice. Will definitely recommend! Everything about this experience was wonderful! All of the staff was so kind and made me feel so comfortable. My questions were answered right away and in depth. Very nice guy who also is easy to talk to and a strong medical counselor. The doctor was very quick and i felt like was not very thorough. It would have been nice if he was more detailed. I felt like I was rushed. Very professional and knowledgeable. He definitely cares about you and wants to help you out! No-nonsense, quick and easy scheduling and visits, and Dr. Martinez-Diaz and his staff are very nice and helpful! Dr. MD is professional, confident, knowledgeable and empathetic. After my first two visits, I would highly recommend his for skin condition concerns. Staff was welcoming and very friendly. Dr. Martinez-Diaz was very knowledgeable and took the time to thoroughly review and discuss my son's condition, causes and treatment options. I didn't feel rushed at all and he welcomed questions. Dr. Martinez—Diaz is awesome! He’s truly one-of -a-kind. Great personality, very knowledgeable and informative and wonderful bedside manner. I would 100% recommend him to anyone. Keep up the great work Doc! Despite their warning about parking in the west loop, I found a spot and was very pleased with Gab and his staff. I’ve been in a few times now, each time I was seen within 2-3 minutes. Professional staff, great doctor, takes my insurance, has access to great facilities and equipment. I mean, it’s the dermatologist, I don’t leave thinking “wow that wasso fun!” but as I sit here thinking of my visits there’s literally nothing within the control of the doctor/staff that I would say needs improvement. He is an excellent physician. His bedside manners, hospitality, and medical staff really make you feel comfortable. This is a very sorry excuse for a Dr. he double billed me and was beyond rude to us when trying to resolve this. I called multiple times and he hung up on me and called me names that I willnot repeat. I really regret ever going to his office. I strongly advise Do Not go to this place. They are the worst!!! Professional and clean office. Nice office staff and a informative visit that addressed all my concerns. A+ experience. One of the best doctor offices I have been in. High tech, efficient, great bed side manner and Doctor is well skilled in his profession. Dr. Martinez-Diaz was thorough, kind, and patient. He made sure I had time to ask any questions or offer any concerns. He answered all of my questions. The appointment was quick and easy. This was my first time getting a filler and the process was amazing! Dr Martinez and his staff were warm and caring and made me feel so totally at ease! I'm thrilled with the results and the service. My instincts were right on this facility/doctor and I'll be back. The doctor is very nice and very knowledgeable. Besides the long forms that I had to fill out ( should have done it online), I was accepted right away. I was referred to Dr. Martinez-Diaz by my friend and so happy she did!! After having an extremely frustrating experience with my previous dermatologist I had almost given up hope!! So glad I listened to my friend! Dr. Martinez Diaz wasvery efficient and friendly and I never felt rushed!! He was very honest about my skin condition and my treatment options too. I would 100% recommend him. The office staff is also super friendly and courteous!! Great doctor and I would highly recommend him! Dr. Martinez-Diaz was awesome!!! I mentioned my condition and concerns and he addressed them professionally and made me feel comfortable and at ease! He was patient and extremely kind! He took his time to explain everything and I left the officefeeling great about my decision on choosing him for my dermatology visit. I cant wait to see results! Thank you for your help! Everyone was so per nice and professional. Very thorough, addressed every issue I brought up, and had me in and out very quickly. He and his staff were also very knowledgeable about insurance issues, and could include this information in our discussions about treatment. I've found my regular dermatologist! I highly recommend Dr. Martinez-Diaz!